My two dogs are enjoying their Saturday post-breakfast walk, sticking their noses in the snow, still pristine from the night before. I look up to see a beautiful young mother, with long brown hair, tilting her stroller so her baby can get a better look at the dogs. Her husband, standing beside her, smiles. I notice his yarmulke; they are Orthodox Jews walking home from synagogue. Usually I feel a sense of otherness when I encounter the many Orthodox Jews who live in my neighborhood. For one, my father raised me to be repelled by any type of extremism, particularly of a religious nature. I feel some embarrassment at the the large numbers of children many of these families have, the way the women cover their hair, arms and legs, their insularity—their kids go to private Jewish schools. The Orthodox Jews in my neighborhood, I don’t believe, view secular Jews as their people any more than we do them. One day, when I greeted a woman with a “Gut Yontiff,” her jaw dropped, and a bemused smile crossed her face. I am a Jew, of sorts. My mother was faithful, kept a kosher home. We sometimes attended Friday night services and all the High Holidays. My father, a devout atheist, attended temple out of love for our mother. But he did not hide from us his dislike of institutional religion. I married a non-Jew. I had read that children raised without religion, or a mixture of the two parents’ religions, grow up confused, in a religious oblivion. My husband, a scientist and an atheist, agreed that our children could be raised Jews. We joined a Reform temple, and the children attended Hebrew school. Our daughter celebrated her bat mitzvah. She did a show-woman-like job, her beautiful voice filling the small sanctuary. My out-of-town relatives were in late middle age or elderly, but many flew in for the event, despite its being winter in upstate New York. As the service was about to begin, the rabbi, looked around the half-empty sanctuary and turned to me, “Is this all the people coming?” I longed to tell him what I thought of his question, but held my tongue. Mysteriously, although both my Jewish parents served in the military during World War II—he in the U.S. Marines, she as a sergeant in the British Army, neither told me about the Holocaust. I was sitting in sixth grade history class, the only Jew in the class, when the teacher showed us (apparently without parental consent) Night and Fog, a graphic 1956 French documentary that alternates between past and present images of the concentration camp Auschwitz. I watched in disbelief and horror at photos of hundreds of emaciated, naked bodies being bulldozed into pits, roomfuls of shoes and hair. The Nazis wasted nothing—even the fat from the bodies was used to make soap. When the lights came on, I was someone else. Growing up, I remember that when a heinous crime was reported in the national news, my mother would say, “I hope it wasn’t a Jew.” I would look up to the ceiling, thinking she was being overly dramatic. Like many American Jews, I was complacent. My mother was smart. She had lost family in the concentration camps; she knew anti-Semitism, which has existed for centuries, is never gone, it’s just sleeping, waiting for the powers that be to awaken it from dormancy. A person with exactly two Jewish grandparents is considered to be either a Jew or a Mischling (mixed blood) of the first degree. A person with only one Jewish grandparent is considered to be a Mischling of the second degree. And of course, those determined to be Jewish were eventually rounded up and sent to death or work camps. President Donald J. Trump, who used to work for his dad, Fred, removing the coins from the washing machine in the laundry room at Grymes Hill Apartments in Staten Island where I grew up, has once again created a safe place for the ugliness of racism, sexism and anti-Semitism. Last night I lit the Sabbath candles for the first time in a long time, for my mother and for my people. 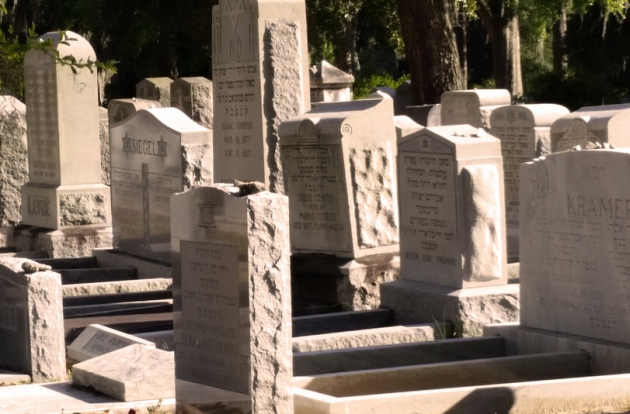 Days earlier, at least a dozen headstones were toppled at Waad Hakolel, a Jewish cemetery in Rochester, New York, where I live. A police investigation is underway. My parents are buried in a Jewish cemetery in Staten Island, the only New York City borough that voted overwhelmingly for Trump. I worry whether their tombstones are safe. Today, I walked through my Rochester, New York, neighborhood, the streets full of Jews walking home from synagogue. And I thought, yes, these are my people. Donna Jackel is a freelance journalist based in Rochester, NY. Her work has appeared in The Bark, The Chicago Tribune, BBC Travel, The Chronicle of Higher Education and many other national and regional publications.